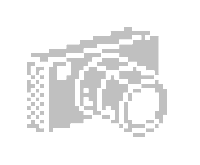 For the past few months, I've been working (part time) on an Adventuron port of one of my favourite games from the dawn of the twilight era of 8-bit text adventures. The Beast is the simple tale of a junior reporter, investigate sightings of a wild beast in the moor adjacent to a local village. The Beast is a game of three acts, the first being to make your way to the village. 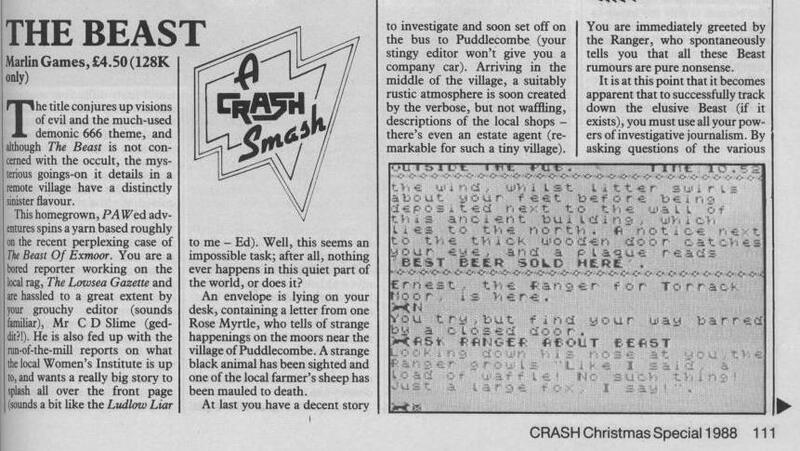 The second act is the investigation / preparation section of the game, in and around the village of Puddlecombe-by-the-moor. The third act is an adventure on the moors. 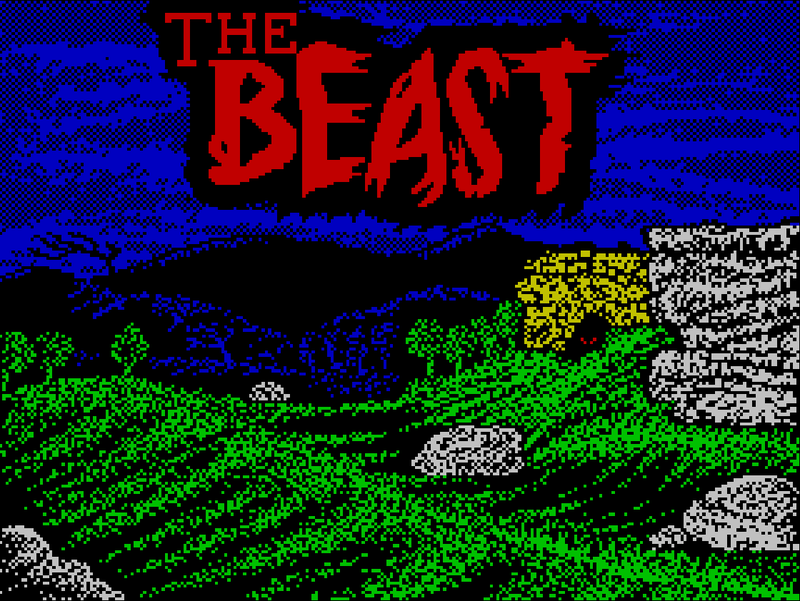 The original version of The Beast was released in 1988, by Linda Doughty, for the ZX Spectrum 128K. It was originally published by Marlin Games, then later released by Zenobi Software. 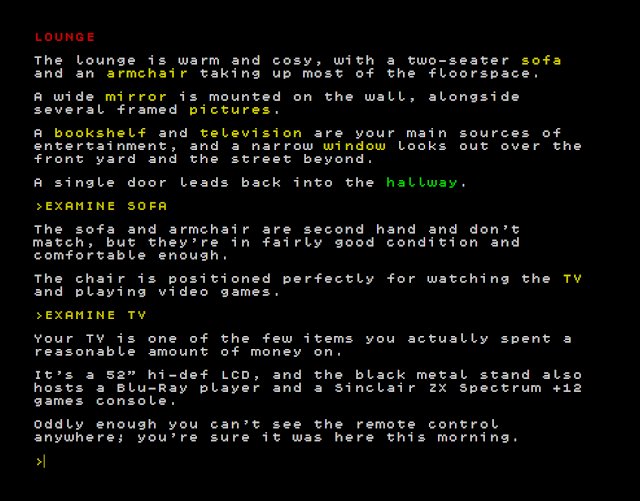 It is a quintessentially British text adventure. Developed by a Brit, on a British home computer, manufactured in Britain, using a British Adventure Creation utility, set in England, and features tea shops, pubs, village greens, baked beans, and a lot lot more. Linda self-published her games, as was rather common back in the 80s, and she used the PAW adventure creation utility to create her games. What's quite different about The Beast is that the narrative is front and centre, with Linda skillfully stage managing the npcs movements and behaviors throughout the fictional day. Linda also created a handful of graphics for The Beast, so technically she could have called it a illustrated text adventure, but Linda is a very honest person, and obviously believes in truth in advertising, as demonstrated in the advert below. 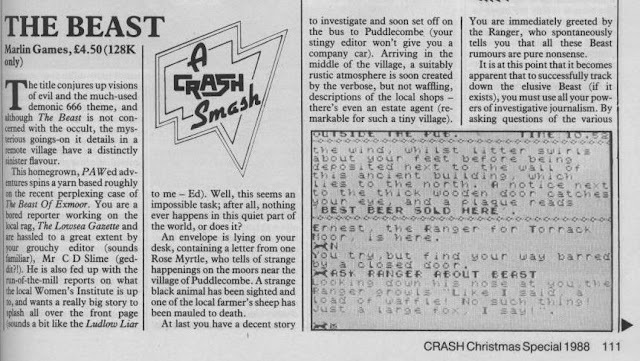 The game received the coveted "Crash Smash" award in the Christmas 1988 issue of Crash. Your Sinclair was slightly less kind, but it was off the back of the YS review, that I put my money in an envelope, and I came to be an owner of The Beast. This 30th Anniversary version attempts to hold onto what was good about the game, whilst making the process of playing the game as pleasant as possible for modern players. The visuals and typography have been tightened up, and there has been a lot of work expended on just getting the "feel" of it just right. This version of The Beast is also made with permission from Linda, and I hope that I've done a good just with respecting her legacy. There are some changes, but edits are there to help beginners, or to make the game a little bit more accessible. A huge thank you to Andy Green for his superb artwork, as well as Paul Van Der Laan, Eeve Somepx, and Pentacom, for their excellent fonts. There is more information / waffle, on the Itch page. 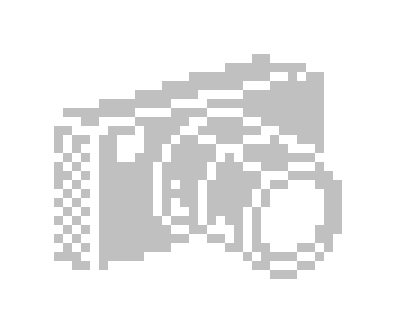 (1-bit graphics by Andy Green). FREE - Absolutely no cost. CHOICE OF STYLES - Multiple skinning options, including several "retro" skins, and the ability to use modern truetype fonts. NEW ARTWORK - Addition of new retro-style artwork from the wonderful Andy Green. Andy spent a great deal of effort crafting dozens of incidental graphics, a brand new loading screen, and a brand new end-game graphic. (NOTE: Where it made sense, some of Linda's original in-game graphics remain) . TIMETABLE COMMAND - The 30th anniversary ships with a command (TIMES) that will summarize all schedules learned in the world of the Beast so far. WHERE COMMAND - Keep track of (certain) NPCs using this handy command. NEW FONTS - Fantastic fonts by Paul Van Der Laan, Eeve Somepx, and Pentacom, as well as support for system fonts. ADAPTIVE UI - The game adapts to screen size, and will re-format content depending on the device type / screen resolution / screen orientation. ** NOTE : Itch.io has temporarily rendered the game unplayable on mobile, but I am hopeful for a quick resolution. SUBTLE REFINEMENTS - Bugfixes, and enhanced usability features (such as click to navigate in some skins). BLIP HEAVEN - If you love blips, you got blips. If you hate them, switch them off. MODERN DEVICE SUPPORT - Modern device support via HTML5 technologies. NOT EMULATION - The game has been ported to a new engine that is free of the limitations of emulation (such as being able to have an adaptive layout depending on device type). TOUCH UI - The first release ships with a basic touch event handler. Touch a noun to append it to the command line. Touch a direction word to move in that direction. Long press a noun, to submit an examine command. AUTO-SAVE - A revisit to the game page will resume where you left off. AUTO-COMPLETE - Press Tab to autocomplete known verbs / nouns. 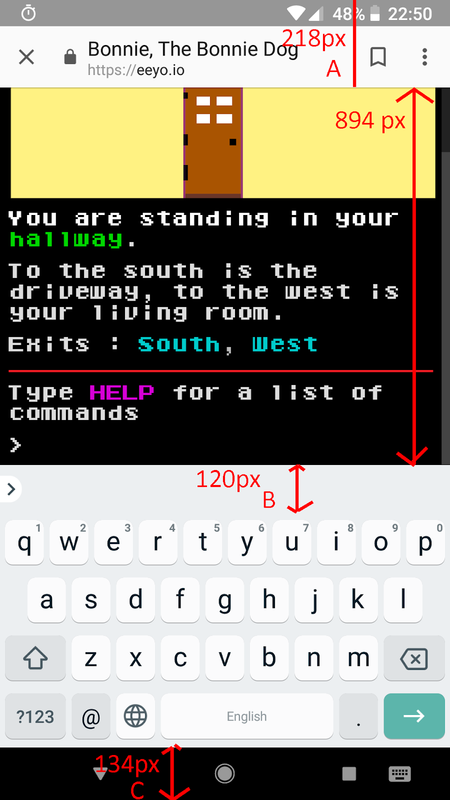 The mobile version of the game is not being served correctly via Itch (locked into horizontal aspect ratio). A bug report has been raised. 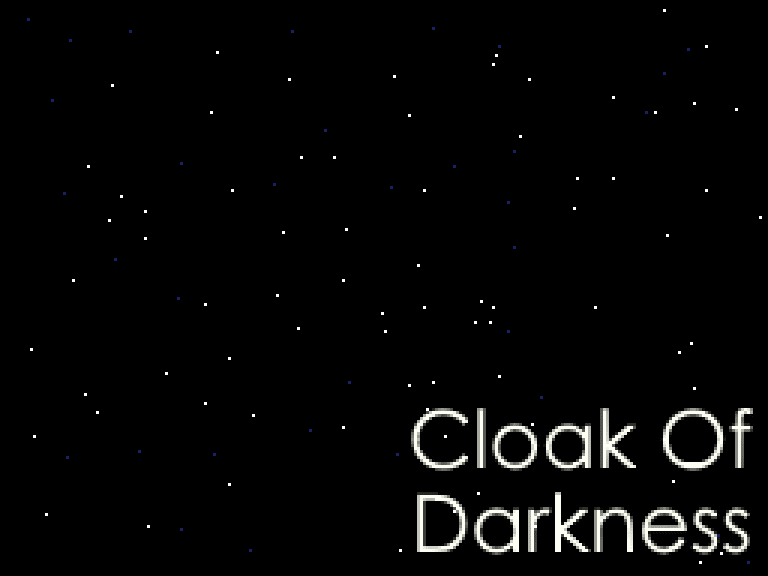 For comparison purposes, here is a port of the hello-world-esque reference text-adventure "game" Cloak of Darkness (by Roger Firth) to Adventuron. Apologies for the poor "art". A playthrough follows after the source. 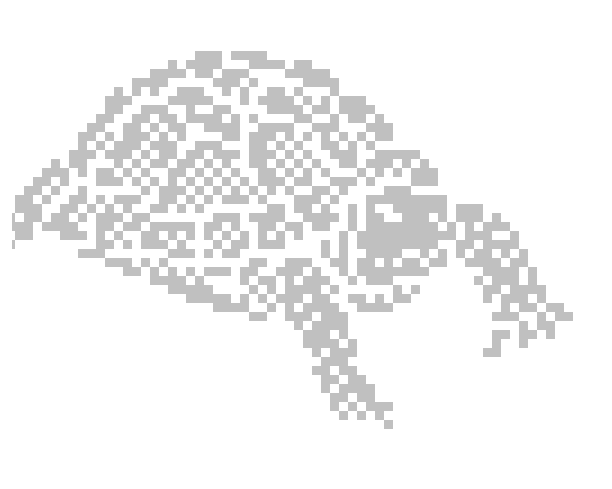 Unhallowed is a new PAW text adventure game, by @blerkotron, for the ZX Spectrum 128K (and compatible machines such as ZX Next) and web browsers (via Adventuron). Unhallowed was developed for the ZX Spectrum using the excellent PAW adventure writing system. Upon finishing writing and testing the game, the game was then ported to Adventuron via the "PAW to Adventuron" converter, followed by a manual text reformatting pass performed by Blerkotron, to take into account the larger screen area. A "loading" screen was then manually added, and a few other minor adjustments made. 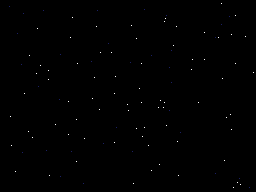 Finally, the game was exported to a HTML file. To avoid spoilers, the screenshot is from early in the game, but things get spookier quite soon after. See the release note by Blerkotron here. The game can be downloaded for 8-bit, and web, here. I thought I'd do a small blog post on the problems I've been having with Android, for about a year now. This post relates to just trying to get a serviceabile keyboard-based UI going on Android, and has nothing to do with the gesture / touch optimized UI that is scheduled for release later in the year. The first problem is that Android's soft navigation buttons are impossible to remove (without hacking your phone) when the soft keyboard appears. This eats up valuable screen real estate. 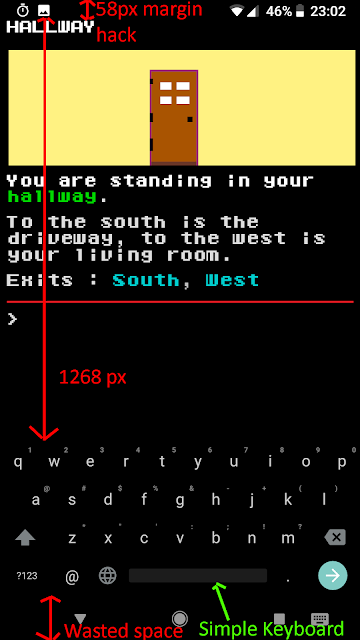 The second problem (in Android OS) is that when the keyboard is visible (together with the soft nav buttons), so is the status bar at the top of the phone. This has the unfortunate effect of overwriting some portion of the location header text. It also takes you out of the immersion in a pixel typographic experience (if that is your game). Pixel fonts look great, but only when not mixed and matched with modern antialiased typography. I guess Adventuron is an edge case! The third problem is that the GBoard software keyboard (the standard Google software keyboard that ships with the majority of phones), is antisocial when it comes to vertical space. I can set an INPUT widget to require noautocomplete, and the old Google Keyboard would honour this request. The new Google keyboard still takes vertical space but doesn't show autocompetions. It looks hideous. This can be rectified with installing a keyboard - such as simple keyboard, but it's too much to ask a casual player to change their system keyboard. I'm very disappointed with Google's decision to not give app developers the option to use that vertical space for themselves. Maybe it's a security feature - to stop web apps from pretending to be the autocomplete bar? Who knows? ... but it makes using Adventuron on Android an awful experience. The fourth problem, and one that I have been pushing to have fixed in Chrome for over a year now is the full screen immersive mode is simply broken in that the bottom area of the view area is obfuscated by the visible keyboard. You can't scroll down and see the invisible area. It's just plan broken.... but there is some hope that this *may* be fixed in Chrome 69. Let's see. ... for sure problem #1 and problem #2 are not getting solved any time soon. In my view, these are poor design decisions at an OS level, and the only workable solution is a bespoke written software keyboard as a bottom clipped widget... So that's ultimately what I'll have to do. In terms of iOS, well, no problems. well done Apple. Never say never, it's possible that GBoard is fixed, the Chrome fullscreen issue is fixed, that new versions of Android do away with the status bar showing when the keyboard is up, and Android allows the sofware nav buttons to disappear when the keyboard is up. Or maybe Google just builds in per-app keyboard preferences, that lets users select a more optimal keyboard -only for text adventures. But it's a lot of ifs. Right now, and at least a year into the horizon, Adventuron will be sub-optimal on Android, at least, without a hack of the highest order (building my own software keyboard). The good news is that the screens are getting longer, and that it actually does feel quite good to type on a mobile keyboard. In time, all of this will be resolved, let's hope. The Final Minute as an experimental piece of interactive fiction, that integrates an innovative real-time text-based sports-action mechanic and multiple endings. Blurring the line between fiction and reality, TFM integrates the real-world news-cycle into gameplay. As timeless as the pop songs in Shrek, TFM is best experienced today. 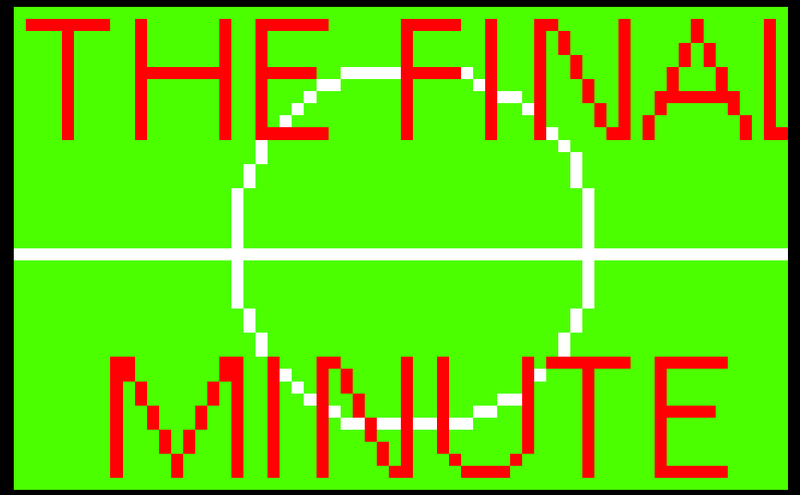 What would you do, in THE FINAL MINUTE? 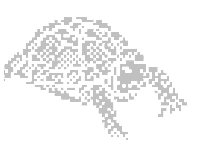 Adventuron doesn't yet have an integrated auto-mapper, but it does have something of a workaround that might help help players draw something of a map. ... to output a text based map of locations that you have already visited. .... to output a text based map of all locations (based on the navigation table). 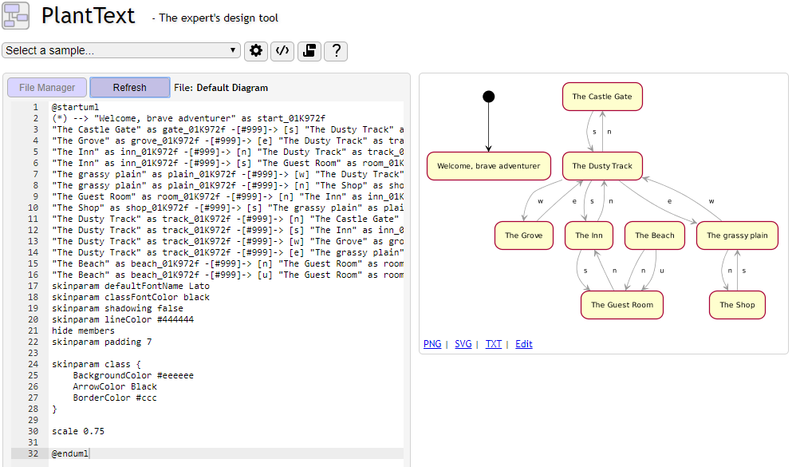 Right now, this process isn't super smooth, so my apologies, but the text based maps need to opened in a text editor, then copy and pasted into https://www.planttext.com/ and the map will be rendered, courtesy of the plantuml and graphviz libraries. The maps aren't north-centric, and therefore are sub-optimal for instant "grokking", but this will improve in future releases. It's difficult to know if the "all" variant of this encourages cheating, or spoiling the game for the player, but if an author is concerned about the all variant, they can block it using a custom T1 handler.